The magnificently designed and state of the art auditorium at Newlands is a platform where imagination and creativity comes to life in memorable and spectacular shows and events. This facility is not only used to showcase student activities and events but is also utilized for community events and institutional functions. The artistically designed auditorium, with its high quality light and sound systems has a seating capacity of 700. It has been a proud host to mega events like TEDxLahore, Teacherhood Conference and cultural and literary events like Dastangoi. 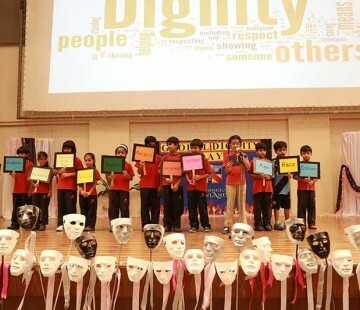 Similarly, a myriad of student activities such as plays, award ceremonies, debate competitions, musical productions, orchestral performances and dance competitions are regularly carried out in the school auditorium, providing our students an opportunity to express their creativity and talents. Such events help develop initiative and confidence in our students and at the same time equip them with the 21st century skills such as creative thinking, information & media literacy and communication skills. On the other hand, such events cultivate an appreciation for arts and culture, grooming our students into refined and cultured audience.